The Vogue Theatre was built in 1938 and views as “ultra modern in every respect, the last word in design, luxuriously fitted with every convenience with the finest project and sounds systems.” It was a northern Michigan variation on an Art Deco theme with a deeply recessed entry that led to a modernistic lobby and a theatre with 935 seats. The Vogue has been unoccupied since 2005. In 2010, a feasibility study funded through USDA Rural Development concluded that the building was structurally sound and should be restored as a Theatre to meet market demands, particularly since there are no movie theaters in Manistee County. 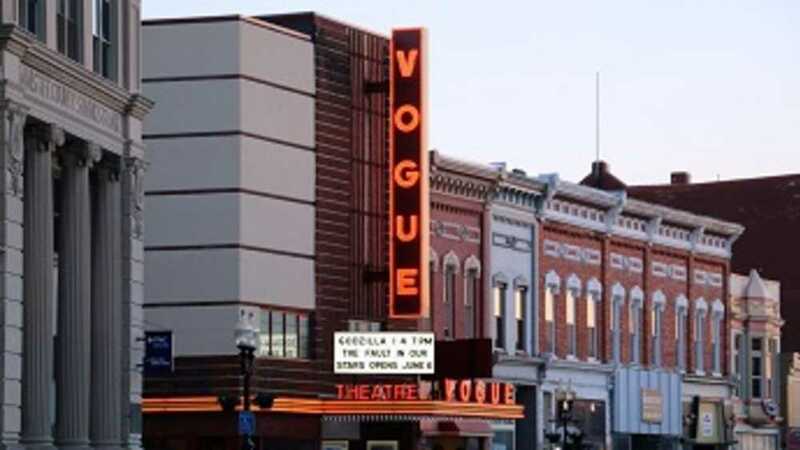 In 2010 the Vogue property was purchased by the Manistee Downtown Development Authority and the property was subsequently sold at a nominal price to the nonprofit that is guiding its restoration. The capital campaign began in 2011, the contractor was selected in 2012 and restoration began concurrent with fundraising in October of that year. A nonprofit was formed, the Historic Vogue Theatre of Manistee (HVTM), to oversee the restoration and ongoing operations of the Vogue. The Board consists of community leaders and is a working, hands-on Board. The Manistee County Community Foundation, a 501 (c) (3) organization, receives and manages Vogue grants and donations. The Community Foundation also holds a Vogue Theatre endowment that was created to provide a source of operating and maintenance capital.